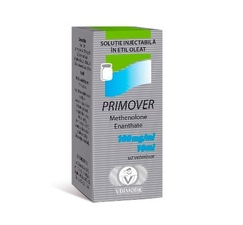 Primover - is the use of an anabolic steroid injection, chemical action which is methenolone enanthate. In bodybuilding drug known as Primobolan. Primobolan is in demand in the sport due to the fact that it is not flavored. Therefore, many athletes looking for anabolic steroids that have a minimal negative impact on the human body, methenolone enanthate is selected. The drug has a weak anabolic effect. To build muscle requires prolonged use of Primobolan. But muscles are going to be very high quality. Steroid practically causes no delays in the body of water. Therefore, the "rollback" to gain muscle mass virtually none. With a weak anabolic activity Primobolan is often used not to build up and to maintain muscle mass.